Click Here. Buy This Book. Seriously. Now. No one element in this book is astonishing, but calling that a negative would be like taking a bite of an incredible new cookie and saying, “Meh. It’s just another cookie. Flour, sugar, butter and some other things. Same as any other one.” Some things are more than the sum of their parts. Some cookies are so good that I keep the whole jar in my lap and refuse to share it with anyone, not even Beloved In-House Reader. This book is that kind of good. It being a book and not a cookie, belly-selfishness does not apply. I am eager to share. Hard Luck is a big bucket of good old-fashioned fantasy fun, and more than that, it is more than just that. Holy wow, is it more. I love this world and the characters M. A Ray has created for it. Fantasy stories do not have to be about originality, especially not ones that are coming-of-age stories about unwanted outsiders finding a place to belong and setting out on the path to become a shining star. Especially not fantasy stories about unwanted outsiders who have a hidden heritage/destiny that they will have to take up. There’s a reason those tropes are so popular. They touch on emotions and conflicts that speak to almost everyone. They made a great foundation. The trick is building something interesting on the bedrock foundation–creating a world that is complex enough to feel real and creating a hero who has struggles that make sense. 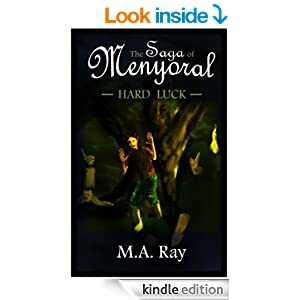 M. A Ray does that, and then presents the result in prose that is deceptively simple and yet shifts seamlessly with the perspective of the characters. Every detail revealed as the plot develops adds to the reader’s understanding that there is much more to every situation than meets the characters eyes. The world-building is right where it should be: in the background. The past is where it should be: in stories and asides and comments. The action moves along fast enough to hold interest, but with plenty of room for characters to interact and develop. If you’ve read any of my other reviews, you know I am not inclined to gush. I am a nitpicker, and a detail-noticing critical reader of the most demanding kind. Hard Luck has structural flaws that usually drop me out of a story the way cutting the cords of a parachute sends a skydiver plummeting to the earth. It contains indie-publishing foibles that usually bother me the way the sound of fingernails on a blackboard bother other people. There are issues, yes, but I would have to give it 6 stars out of 5 if it didn’t have those flaws. I liked it that much. Seriously. Sometimes–rarely, oh, so rarely– a story comes along that is so much itself, so solidly designed and so beautifully presented that I stop noticing little things like too-exuberant use of adjectives, weird paragraph structure, odd name choices, and grammar hiccups. This is one such book. The first few pages did not spark my interest, because prologue, but then, a few paragraphs into the main story, I stopped reading. I immersed myself in the words and rolled around in them like a cat in catnip. I stopped reading and started living the story along with the characters. That doesn’t happen often even with books that are polished to a much higher technical standard. It was an amazing experience, and that’s not even the best part. The best part? There are two more books, and each one gets better. Oh, yeah. Yes. That's how I felt, too. I stopped reading. I started experiencing. It's the book magic. the best kind of magic.